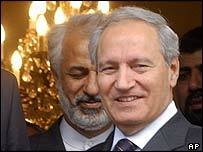 Syria has announced it is restoring relations with Iraq, after a break of more than two decades. Syrian Foreign Minister Farouk al-Sharaa told a regional foreign ministers' meeting in Turkey that ties would be resumed as soon as possible. Diplomatic relations between the two states were severed in 1982 after Syria sided with Iran in its war with Iraq. Analysts say security will be central to the new relations as Syria has been accused of fuelling unrest in Iraq. Most other Arab states restored relations with Iraq in September last year. Earlier at the Istanbul meeting, Turkish Prime Minister Recep Tayyip Erdogan issued a sharp warning about the security situation in Iraq. Foreign ministers at the meeting said they would increase co-operation on border security to stop what they called terrorist infiltration. The BBC's Richard Hamilton says that Damascus is coming under a lot of pressure at the moment. He says it was international pressure that led to its withdrawal from Lebanon last week and now it seems likely that Syria has been encouraged to co-operate with the new government in Iraq. Washington and Baghdad have consistently accused Damascus of fomenting unrest in Iraq. Syria tightened its border controls after allegations that militants were crossing over into Iraq. In February, Damascus handed over a most wanted half-brother of Saddam Hussein, Sabawi Ibrahim al-Hasan al-Tikriti, despite earlier denials that people like him were operating on its soil. Mr al-Sharaa expressed support for Iraq's efforts to find unity and stability and said ties would be resumed at "the earliest possible time". Iraqi Foreign Minister Hoshyar Zebari said security was an important element of this new spirit of co-operation. "We hope that relations would improve in all domains, including in the security domain," he told news agency AFP. He said terrorists should not be given "the chance to use these borders".